President Clinton and his family may not have goats as President Lincoln did, flying squirrels as President Theodore Roosevelt did, or ponies as President Kennedy did, but two animal friends hold special places in the Clintons' hearts. Socks the cat and Buddy the dog are the most recent additions to America's family of First Pets. In addition to finding their way into the lives of the First Family, they have captured the hearts of Americans across our nation. 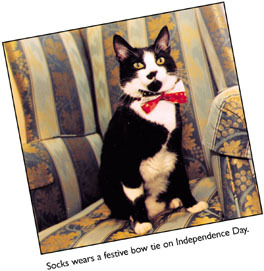 In this special section, we've answered some of your most frequently asked questions about Socks and Buddy. How did the Clintons get Socks? One day, Chelsea's piano teacher found two kittens under the porch of her house. Although the teacher tried, she was unable to reunite the small strays with their mother. No one seemed to know where they belonged. When Mrs. Clinton brought Chelsea for her piano lesson, they noticed the kittens rollicking in the teacher's front yard. Chelsea reached out to the kittens, and the black one with white pawsSocksjumped into her arms. From that moment, he was part of the family. With the help of a local animal shelter, a good home was found for Socks' brother. How did Buddy get his name? 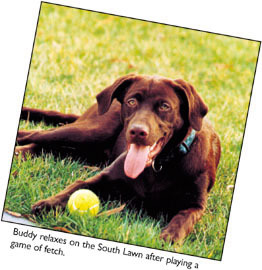 Buddy, a chocolate Labrador retriever, was born in Maryland. He was still unnamed when he arrived at the White House in December 1997. As a result, thousands of children wrote to the President to suggest a name for the new First Dog. After much consideration, the President settled on the name "Buddy," the name of President Clinton's beloved uncle who had died earlier that year. His Uncle Buddy trained dogs for 50 years, and, as a child, the President talked with him often about raising dogs. Because the President's uncle was so important in his life, "Buddy" was the perfect choice. Do Socks and Buddy have Secret Service protection? Because Socks and Buddy are always at the White House or with a member of the First Family, there are always Secret Service personnel nearby, but they don't have special agents who look out for them. However, both pets do have many friends in the Secret Service who give them special pats on the head and a treat now and then. They also have many friends on the White House staff who make sure they get lots of exercise and food to eat. Socks and Buddy hope you've enjoyed learning a little bit more about them and the Presidential pets who came before them. If you have pets, be sure to take very good care of them, and they'll be good companions for you just as all of the First Pets have been for the leaders of our country.